BurdaStyle rocks! I downloaded a pattern for a toddler's jumper/dress (The Vivienne Jumper) last week and made it up today. 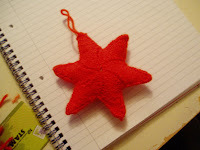 It is super cute and super quick and easy to make. I can't wait to get Smem into it - she'll look so cute!